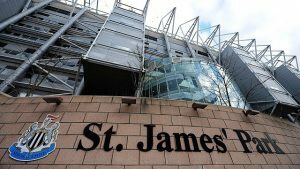 The Imposing and iconic St James’ Park stadium of Newcastle United FC looks over our proud city from its hill at the Gallowgate. Many recognise it as the city’s heartbeat. Getting the opportunity to be shown around St James’s Park is a dream that many in the city share. The service users of Jigsaw Recovery Project were rewarded with living this dream after a month of excellent engagement and hard work with the project. Our service users got a guided tour around the famous stadium and were privileged to see areas that are normally restricted to the public . Areas that only the staff and players get to see. The highlight for many was an insight into the players dressing room and being able to sit in the same places where their heroes get to hear tactics being issued pre-game and see facilities used by the club physio to prepare them for match day. The guide explained why the away dressing room was smaller than the home dressing room and why it was painted and laid out in a way that deliberately made it uncomfortable for visiting teams. It was very interesting to see the lengths that professional football teams use psychology, to put the opposition off their game and to make sure their visit to the stadium is an intimidating one. The tour was completed with a walk down the tunnel accompanied by the “Local hero” soundtrack to sample the experience the players feel on match day. There was lots of photo opportunities for our young service users to create happy memories for what was a special day. One of our service users whilst pitch side, sat in the manager’s chair in the dugout, he mentioned that it made his day to sit in the same chair that is graced by NUFC manager Rafa Benitez. A great day was had by all. Jigsaw Recovery Project would like to thank Newcastle United for the warm welcome and information on the stadium. Let’s hope a visit for our project will bring them some good luck in the coming season. Young people face a number of challenges in today’s society. Entering adulthood comes with its own demands. We at Jigsaw Recovery Project are at hand to help with that transition. You can contact us by completing our enquiry form or using the details below.